Dr Ingram and Partners are proud to offer the highest standard of patient centred healthcare. We have a clinical team of 7 doctors, 3 nurses and a healthcare assistant. We run many clinics for the management of chronic diseases such as asthma and diabetes and offer a wide variety of other medical services including antenatal and postnatal care, minor surgery, childhood vaccinations and well person check-ups. The surgery is based on Park Street opposite the junction to Firby Lane and 50 metres from Ripon Hospital. The practice works on two floors and has disabled access, and an automatic door into the surgery and a lift providing access to the 1st floor. 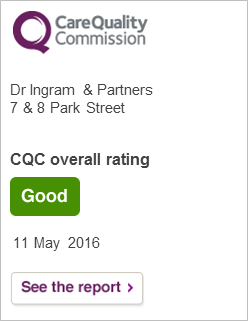 Our practice was inspected by the CQC (Care Quality Commission) as part of the routine inspection programme, on 11th May 2016 and rated good. The full report can be viewed by clicking on the link on the right. Our telephone service is not available outside of normal working hours and access to the building is only for patients who have appointments. For more information on appointments, please click here. Extra appointments are being provided in the evening at weekends from premises in Harrogate and Ripon. The service is an extension of your GP practice and offers pre-bookable, routine primary care appointments with a range of clinicians including, GPs, nurses and healthcare assistants. To download an information leaflet about this service, please click on the attachment below. Our website is designed to make it easier for you to gain access to the information you need. In addition to everything you need to know about the practice, you can use our online services to; book appointments, order repeat medication and to access certain aspects of your medical record. To register for online access please click here, alternatively please come to the surgery and speak to one of our receptionists. Our online services policy can be viewed by clicking on the document below.